Cha Cha’s, “Home of Wild Women and Wise Guys” and “Live Entertainment for the Hole Family” is gone from the new Coney Island, but the video “Coney Island Poker Face” lives on! Shot in September 2010 by historian Charles Denson, the video features Cha Cha’s regular Frankie Oil dancing to Lady Gaga’s hit while his pal Johnny Corona cheers him on. Try typing “Live Entertainment for the Hole family” and Google will ask — Did you mean: “Live entertainment for the whole family”? Nope, we meant “Hole Family.” The charmingly idiosyncratic spelling on the sign is visible in Denson’s slow pan of the Boardwalk bar and cafe, which also takes in the floral wreath for Cha Cha’s longtime manager John Thomas, who had just died, and the lettering of the doomed Shoot the Freak next door. Was “The Hole Family” a painter’s typo? An inside joke like the sign’s enigmatic “Don’t Sleep”? It definitely caught people’s attention and became a conversation piece. ATZ uncovered clues to the identity of “the Hole Family” a few years ago, but amid the upheaval over Cha Cha’s Boardwalk bar losing its lease in 2011 and the move to Surf Avenue sans the original sign, we never had a chance to write about it. 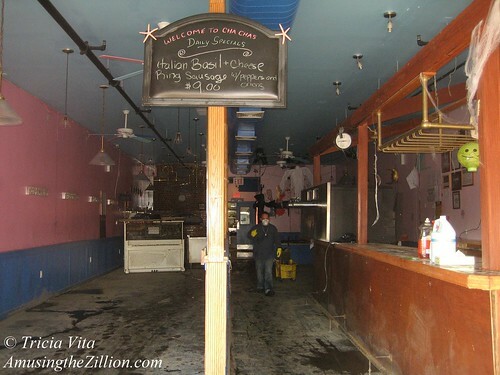 Cha Cha’s officially closed after SuperStorm Sandy. 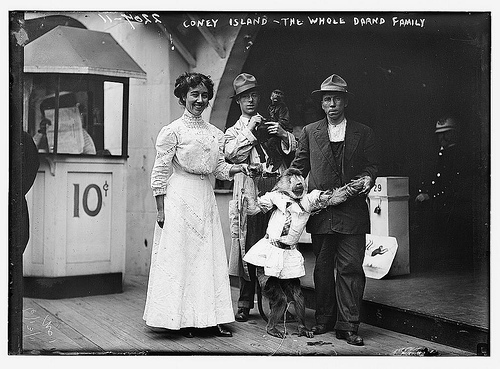 “The Hole Family” is related to the Whole Darnd family, who are pictured visiting Coney Island with their monkeys in this vintage photo, which also happens to be part of the mosaic at the top of this blog. The Darnd family is a polite takeoff on the title of Edwin S Porter’s silent screen hit “The Whole Dam Family and the Family Dog” (1905). According to one of the many comic postcards and lithos featuring the Dam family– Mr. I.B. Dam, Miss U.B Dam and their relatives — they were the most popular and widely known family in the United States on account of their unfortunate last name. “Too much notoriety” was rumored to have killed the Dam Family. The curious thing is that at 2:36, the animated letters spell out The Hole Dam Family before the last letter, the “W,” finally tumbles into place. Just to let everyone know, Cha Chas on surf ave is officially closed for Good! Thanks! Yesterday’s announcement did not give a reason for the closing. Given the challenges faced by businesses in their rebuilding efforts, we’d have to guess that Sandy is responsible for shuttering this Coney Island mainstay, which had survived the death of its manager “JT” and eviction by Zamperla. Cha Cha’s former Boardwalk location was the site of the original Club Atlantis and is now Tom’s Restaurant. John “Cha Cha” Ciarcia also owns Cha Cha’s In Bocca Al Lupo in Manhattan’s Little Italy. Last season, in addition to relocating his Coney Island bar to Surf Avenue, he put his name on Cha Cha’s Steeplechase Park on Thor’s Stillwell Avenue property. The park had carnival rides as well as an al fresco bar. 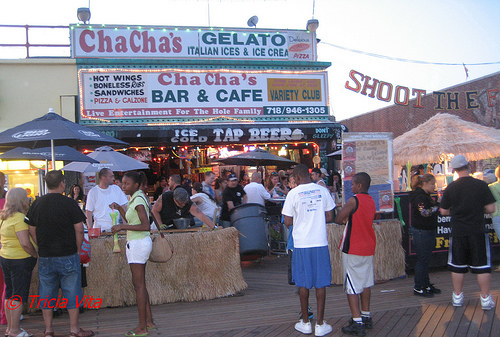 Will Cha Cha’s name turn up in another location in Coney Island? That depends whether he still has sand in his shoes after Sandy. We’re not saying goodbye to Coney Island’s “Home of Wild Women and Wise Guys” and “Live Entertainment for the Hole Family” just yet. The official name of the new amusement park set to open on Thor Equities Stillwell lot in Coney Island is Cha Cha’s Steeplechase – The Fun Place Amusement Park, according to an announcement yesterday by restaurant and club owner John “Cha Cha” Ciarcia. His Club Atlantis, which was evicted from the Boardwalk at the end of last season, is making a comeback on Stillwell, too. Given that signs briefly appeared on the lot with a Tilyouesque Funny Face resembling Cha Cha heralding the return of his Club Atlantis, perhaps we should have seen this branding campaign coming when we wrote “Exclusive: Goodbye Flea Market, Hello Steeplechase Park”(ATZ, March 5, 2012). All smiles–The ‘funny face’ Steeplechase caricature, 1951. Brooklyn Public Library, Brooklyn Collection. 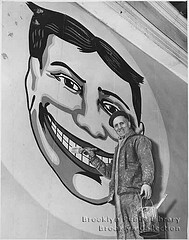 George C. Tilyou’s “Funny Face,” variations of which are used to promote a slew of Coney Island products and businesses today, was original to his Steeplechase Park (1897-1964) and inspired New Jersey’s “Tillie.” The world-famous park was billed as “The Funny Place, Where 10,000 People Laugh at One Time.” Word on the street is that the new Steeplechase Park’s ride tickets will be emblazoned with the Coney Island Cha Cha logo. The lot was leased to the BK Festival for last summer’s flea market and this season’s combination of amusement rides, games and food, along with a smaller selection of merchandise vendors. There will also be a Cha Cha’s Kiddie Park and Cha Cha’s Side Show Park on Thor’s Surf Avenue lots and Cha Cha’s outdoor Club Atlantis Bar on Stillwell. His former Boardwalk location, which is now leased to Tom’s Restaurant of Prospect Heights, was the site of the original Club Atlantis. 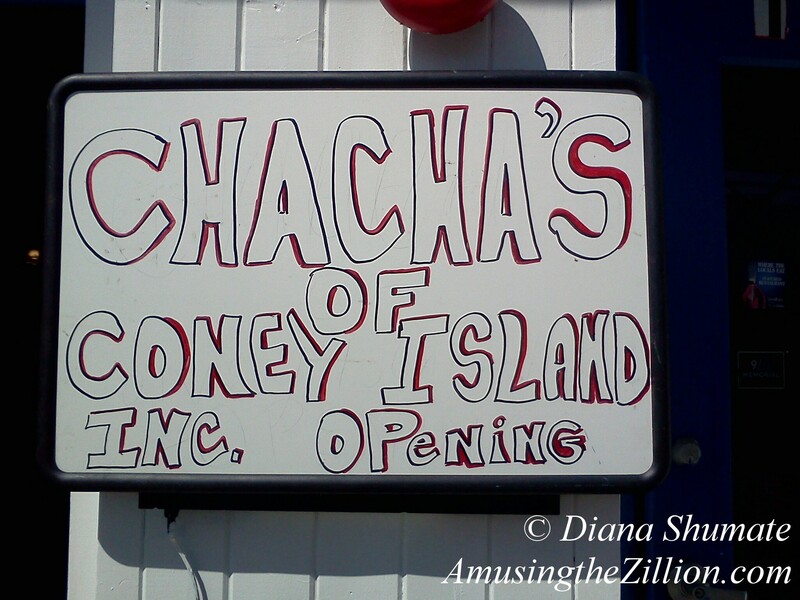 The return of Cha Cha’s Club Atlantis and an outdoor bar resembling Beer Island marks the return of all of the bar and restaurant owners who were part of the “Coney Island Boardwalk 8” evicted by Zamperla. 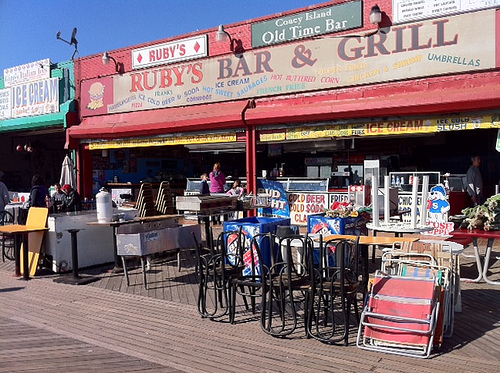 It comes at a time that both Ruby’s Bar and Paul’s Daughter, who were offered leases after the initial evictions, are getting their renovated Boardwalk spaces ready to open on Memorial Day Weekend. Gyro Corner Clam Bar has a location at 12th Street and the Bowery. Steve’s Grill House moved to Thor’s Surf Avenue lot at Henderson Walk. Cha Cha’s Coney Island Seafood Bar & Pizzeria in the former Surf N Turf Grill debuted on Easter Sunday. The Surf Avenue spot will have its grand opening on May 19 with special guest host Vincent Pastore of “The Sopranos” and a live performance by Killer Joe and the Mighty Lido Soul Quartet. Full press release below. Long time Coney Island personality John “Cha Cha” Ciarcia , who many know from his role on The Sopranos and his co-hosting of The Wiseguys Show on Sirius Radio, is back better than ever this year, just in time for the kick-off of the summer season, with several different businesses and amusement park lots, after being unceremoniously “booted” off the boardwalk last year in the very public rent/lease dispute with the giant Zamperla USA Corporation, which also affected several other longtime Coney Island business owners. John “Cha Cha” Ciarcia and actor friend Tony Danza will preside over the official launch ceremony/press conference on Thursday, May 24th at 12 noon to announce the official grand opening of the new Cha Cha’s Coney Island Seafood Bar & Pizzeria (at 1315 Surf Ave.), the exclusive world debut of new amusement park ride The MegaWhirl, which was just developed and is the only one of its kind in the world, Cha Cha’s Steeplechase – The Fun Place Amusement Park, Cha Cha’s Kiddie Park and Cha Cha’s Side Show Park (3 parks in total), along with Cha Cha’s outdoor Club Atlantis Bar……all located along Stillwell Ave. between Surf Ave. and the boardwalk. All these businesses combined now give John “Cha Cha” Ciarcia more business space and amusement park lot space than any other one business owner in Coney Island. All three parks……Cha Cha’s Steeplechase – The Fun Place Amusement Park, Cha Cha’s Kiddie Park and Cha Cha’s Side Show Park, along with Cha Cha’s outdoor Club Atlantis Bar (with a full bar) are all accessible from Stillwell Ave or from Surf Ave. Ciarcia wanted his ride parks to reflect the nostalgic, classic feel of the original Coney Island, so he brought in Artie Gillette at Castle Rock Amusements for some classic rides like the Retro-Scooter Bumper Cars, the old classic Himalaya, the Bavarian Fun House, etc. 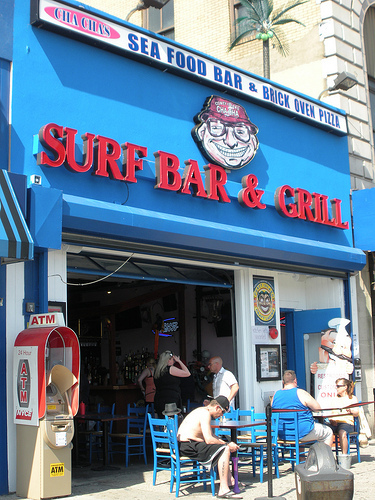 In preparing for the 2012 summer season, Ciarcia first took over the old Coney Island Surf and Turf Grill on Surf Ave. and completely revamped the large restaurant space, which includes the only brick pizza oven in the Coney Island Boardwalk area, a full bar and has even built a stage for live music performances. The space is now called Cha Cha’s Coney Island Seafood Bar & Pizzeria (at 1315 Surf Ave.) with a full menu serving brick oven pizza, various seafood dishes, linguini and clam sauce, mussels, Coney Island crab cakes, clams/oysters/shrimp at the raw bar and featuring live music several nights a week & special events. The new space also has an adjoining take-out cafe right next door, serving the brick oven pizza and various gelatos, frozen custard, frozen yogurt and Italian ices. Ciarcia plans to keep Cha Cha’s Coney Island Seafood Bar & Pizzeria open year round after this summer season. The official Grand Opening Party for Cha Cha’s Coney Island Seafood Bar & Pizzeria will take place on Saturday, May 19th from 7pm on, with special guest host The Sopranos Vincent Pastore and a live performance by Killer Joe and the Mighty Lido Soul Quartet. Memorial Day Weekend will feature Bobby Valli and the Jersey Boys Revue, doing a “Tribute to The Jersey Boys,” on Saturday, May 26th and Sunday, May 27th, with three shows a night at 8pm, 10pm and midnight. There is a $10 cover charge and a 2-drink minimum, or $25 per person for dinner. 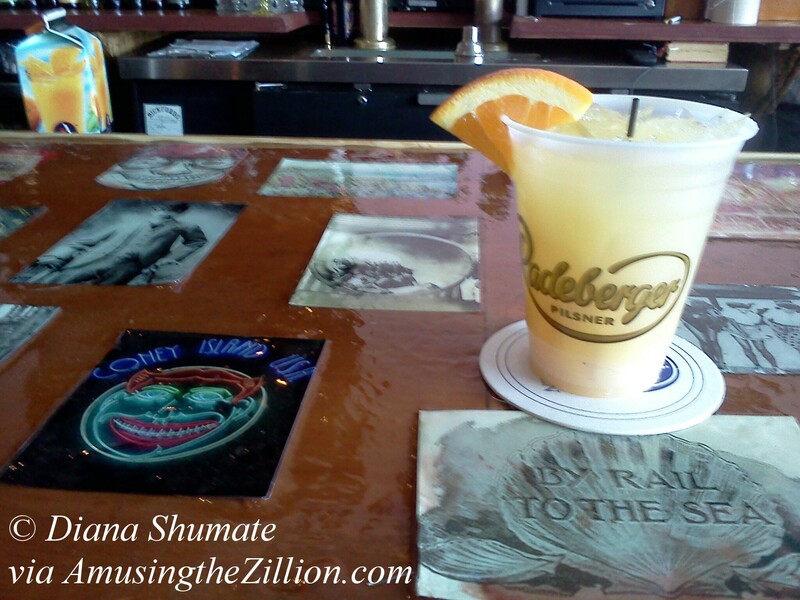 ** Cha Cha’s Coney Island Seafood Bar & Pizzeria is at 1315 Surf Ave. in Coney Island. Phone 718-946-1305 for reservations or more information. 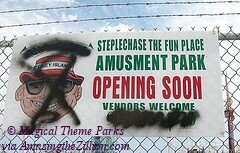 On Sunday, a sign appeared on the fence at the Thor Equities lot on Stillwell Avenue leased to the BK Festival announcing the opening of “Steeplechase Amusement Park.” We’ve known for several weeks that rides and amusements were planned for the former flea market this summer, but details were pending. Will McCarthy, event director of the BK festival, tells ATZ that the flea market didn’t mesh with the Coney Island location and this season the BK Festival will bring in rides and amusements in addition to a smaller number of vendors. The flea market is expected to continue until the rides debut in May. Among the old school carnival flat rides confirmed for the event are a Himalaya, Ring of Fire, Trabant and Cakewalk. There will be also be a climbing wall, McCarthy said. Additional rides and amusements will be announced soon. The BK Festival’s partners went to the carnival convention in Gibsonton, Florida, last month to recruit ride operators for Coney Island. And why not? Coney Island’s three grand amusement parks of the early 20th century were Steeplechase, Dreamland and Luna Park, and the names of the last two are already taken. 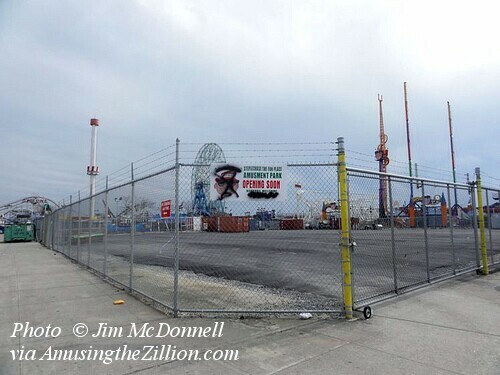 When Joe Sitt brought carnivals to his property in the summers leading up to the 2009 rezoning, he called it Dreamland Amusement Park. Zamperla named their park after Thompson and Dundy’s Luna Park. Although the new parks bear very little resemblance to the originals, the familiar names evoke memories and exert a powerful pull. We’re just happy the BK Festival, which has a three-year lease, will not be a flea market this summer. We wish them well. Evidently one person wasn’t thrilled with this iteration of the Funny Face. The sign, which has a couple of unfortunate misspellings, was almost immediately defaced. The park will be the third Steeplechase. In 1967, Norman Kaufman leased part of the Tilyou’s Steeplechase site from Fred Trump and called his park Steeplechase Park, according to Charles Denson’s Coney Island: Lost and Found. The Jumbo Jet, Cortina, Bumper Cars, Go Karts, Batting Cages and a Miniature Golf Course were among Kaufman’s attractions over the years. Kaufman’s Batting Range and Go Kart City was on this piece of land until he was evicted by Thor Equities in 2007. Another sign on the fence announced “Cha Cha’s Club Atlantis Opening Soon,” setting the stage for two clubs with the same name. 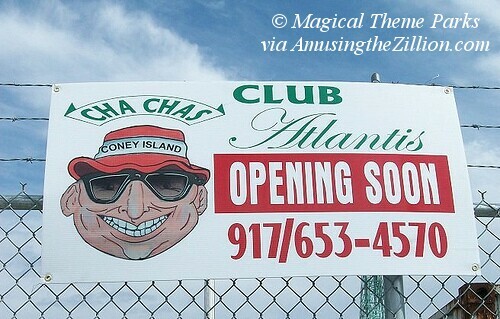 Cha Cha, one of the Coney Island 8 evicted from the Boardwalk by Zamperla, is opening a restaurant on Surf Avenue as well as a reincarnation of his Cha Cha’s Club Atlantis. His former Boardwalk location, which will become Tom’s Restaurant, was the site of the original Club Atlantis. Across the way, the former Steve’s Grill House and Beer Island are set to become Zamperla’s Club Atlantis. Last month, Zamperla CEO Valerio Ferrari told the NY Post that a new beach bar called Club Atlantis would offer beer, wine and dancing. Signage for Coney Island’s Club Atlantis, including this voluptuous mermaid, resurfaced after the sign for the evicted Cha Cha’s Bar & Cafe was removed from the building’s facade. The Boardwalk store was home to the Atlantis from the 1940s through the 1990s. In the last few years of its life, the letters from the famed sign that spelled Atlantis became corroded and were removed. This hand-painted signage replaced it. Does anyone recall who painted it and when? The club had many different owners over the years, including Murray Weingar, a co-owner of Miami’s Copacabana, and bandleader Mousey Powell in the 1940s. In the ’70s, the Atlantis featured a singing cowboy and in the ’90s it became a Latin dance club, writes Charles Denson in Coney Island: Lost and Found. Cha Cha’s, the Home of Wild Women and Wise Guys, was also called Cha Cha’s Club Atlantis until it closed at the end of October. Atlantis bar, grill and dance hall on the Boardwalk, owned by Murray Weingar and Hymie Schuman, operates under blue dim-outs after sundown. Bar trade on main floor entertained by Ralph Lawrence, accordionist; Embassy Trio, singers and intrumentalists, with Ruth Blair doing the vocals. Patriotic display changed weekly in bar’s center. On top deck is a squared arena for the jitterbugs tripping to Sol Curry’s Ork and applauding Karen Kaye’s singing. Tom’s Restaurant of Prospect Heights is renovating the Boardwalk space formerly occupied by both Cha Cha’s and Nathan’s, the site of the original Atlantis. The new restaurant will have a roof deck and is expected to open in April. Cha Cha’s, one of six Boardwalk businesses whose leases were not renewed by Central Amusement International, is seeking to relocate nearby. Thanks to Coney Island photographer and Sunday archaeologist Bruce Handy for these photos!